For centuries, special occasions have included some form of fresh herbs and flowers to accent a special moment or event. In the late 1700’s the art of drying flowers became a ritual to preserve not only the summer gardens for winter décor, but also for medicinal tinctures, perfumes and potpourri. By the early 19th century, the fascination matured and became vogue with many a parlor being graced with elaborate designs encased in beautiful domes and frames. A great number also included butterflies, birds, and animals to portray a complete nature vignette. We are very proud to keep this tradition alive and have one of the few on-site, freeze dry preservation machines in the northeast. Dried flowers are my closet passion and I have been drying flowers since opening the florist. For over 20 yrs I have been a professional freeze dry, flower preservation specialist, and board member of the International Freeze Dry Floral Association. This unique and delicate process of preserving flowers, highlighted on NBC, and afforded the seal of approval from Good Housekeeping; is one of the most sophisticated methods of flower preservation today. Once preserved, the flowers are artfully arranged in decorative frames, shadowboxes, domes, or a host of other ideas. As a floral designer, I bring my talent to these dried and preserved flowers for a wonderful keepsake to be treasured for years to come, with all the memories intact. ….and a host of others. You can also cherish your garden by preserving some of those prize winning blooms, or that lovely vase of roses preserved. 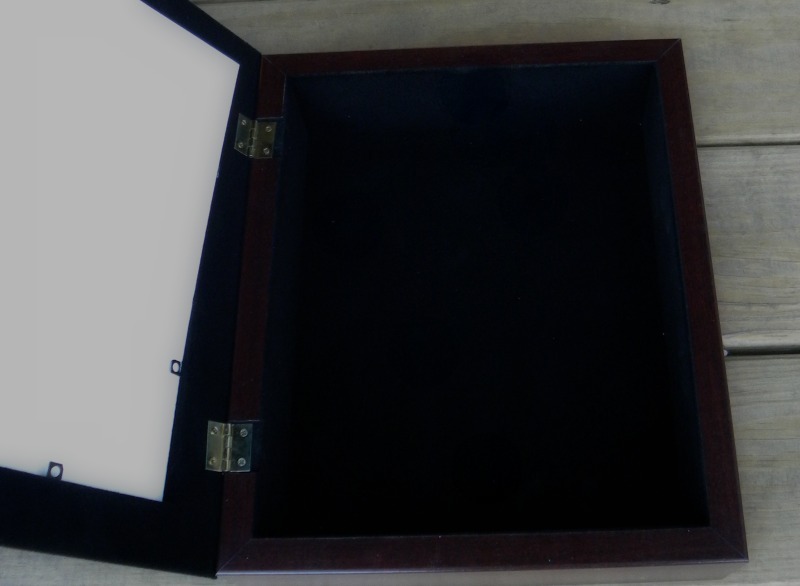 Our custom shadow frames and boxes are American made, by a family owned business in Montana; with many shapes, sizes and finishes to choose: round, oval, rectangle, square and heart. Various finishes include oak, cherry, mahogany, white, silver, gold and black. We can also paint coordinate a custom color to compliment your décor. Ranging in size from 5”-24” diameter for any style of arrangement. 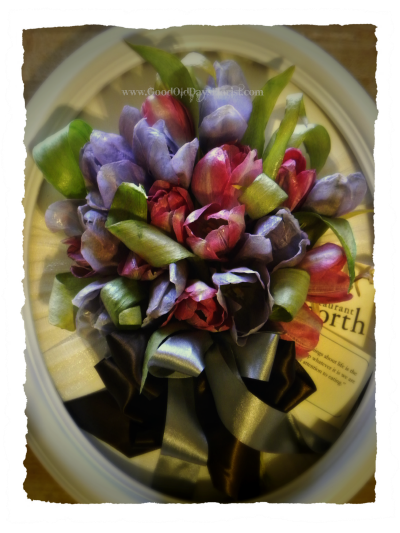 Another spring wedding bouquet preserved. 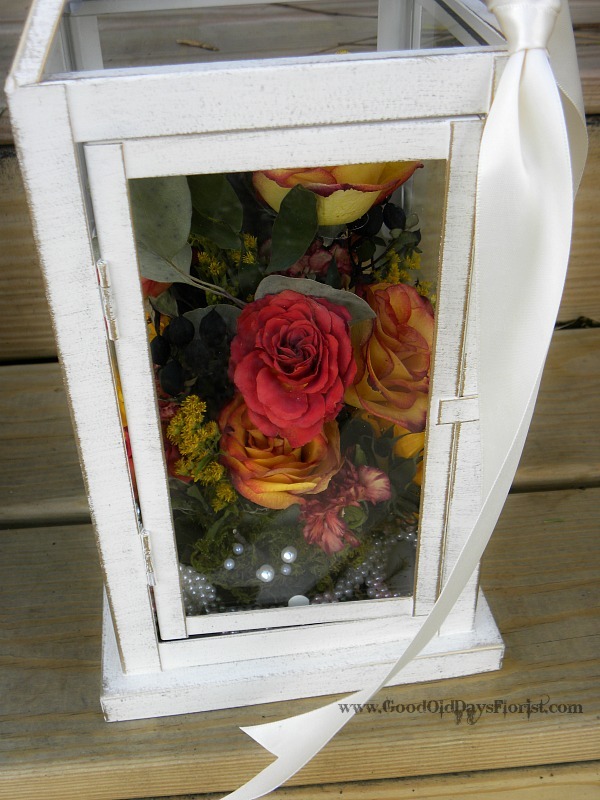 Deep shadow frames & boxes are perfect for adding complete collage of mementos with the flowers. 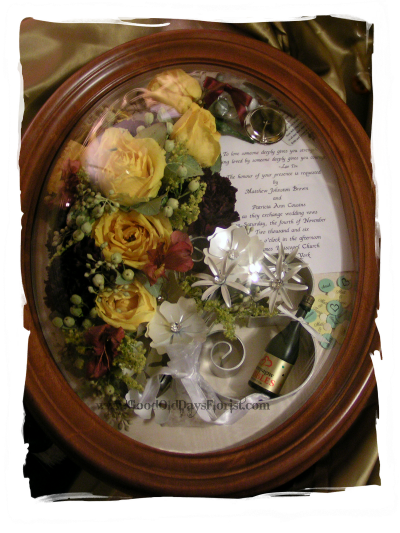 This is one of our favorites and most popular- as it visually tells a story or relates an entire event with its contents that can include not only flowers, but an assortment of your cherished items. These are also perfect for collections, family mementos, antiques, and a host of other non floral items. These are two choices resurrected from the past that are also lovely. The bell jar or ‘cloche’ was used in the Colonial garden to create a miniature terrarium for tender seedlings. Today we not only use them for this true purpose, but as a decorative cover for all sort of precious items. Flowers are placed in a small vase or needled arranger, and the cloche sets right over it. They are a unique accent to any home, vintage or modern, and start quite small for 1 bloom, and graduate up to app. 20’ tall. Second is the wood based domes are a Victorian tradition, but because of their simple design, can look quite modern. Flowers are arranged in an upright design to fill the inside, and then displayed on a shelf, dresser, or table. These start at a single bloom size and go up to a 12’’ tall. Perfect in any room, and not an invading piece. 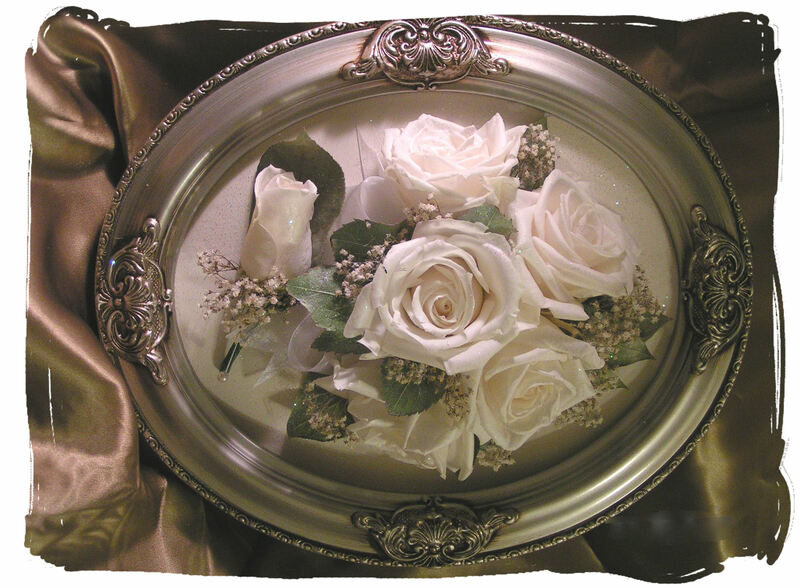 These both are perfect for multiple recipients and especially nice for sympathy remembrances. Having your flowers arranged into a decorative design is an option for those who just don’t care for any of the above or have their own ideas. Keeping in mind that freeze dried flowers are very fragile; with care and a designated display area, this would be an option. 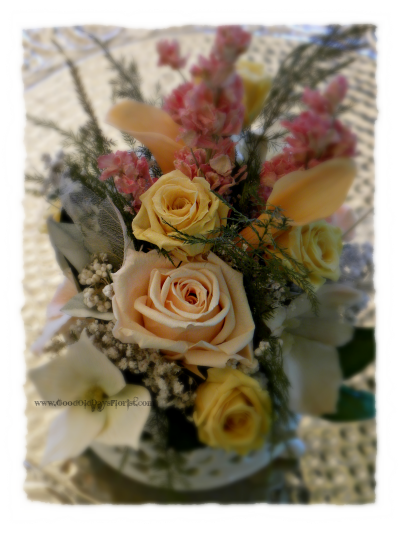 These small nosegay bouquets are also perfect when you have multiple recipients or have just a few flowers. They are small enough to display on a dresser top, vanity, or inside a china cabinet. The tussies mussie holders are a decorative holder to display your poseys, and a wonderful added keepsake. As much loved by the Victorian aristocracy as today, and our personal favorite. Glass houses (terrariums) can capture a botanical charm of times gone by. Originally used for the prized orchid and fern collection; they are also perfect for preserved flowers. Available in assorted styles and sizes with a large size able to hold many flowers. A lovely box that is a multi use option as it doubles as both a flower display and storage keepsake for cherished mementos inside. Available in 2 styles and sizes with dome display areas of either 5×7 and 8×10. This is also a wonderful gift for anyone who is sentimental . Keep your flowers in water, or water any foam or florist container they are in. Mist them lightly with tepid water. Using a plastic bag (recycle your dry cleaner wrap or cello!) completely cover the flowers loosely, and twist tie to keep the moisture level inside. Until you bring them to us, place them in the center* of your refrigerator-not the freezer-or any cool, dark place which is preferably below 50 degrees but above freezing. The cooler they are, the less the blooms will mature and begin to deteriorate. do not place near any interior walls of the refrigerator, as they may freeze. If you are shipping flowers to us; after following the steps above you will need to pack them with plenty of padding, taped or wired in, and including an ice pack if warmer months. We highly recommend overnight shipping-especially in extreme temperature seasons. Yes…we can locally retrieve your flowers for you-ask about our event pickup. Freeze drying ranges from $20. for one flower, to $200. for a standard sized wedding bouquet, and 500.+ for a large memorial heart. The cost of the preservation is based on the amount of space your project uses in the machine. All frames, domes, shadowboxes, and tussies are additional plus a design fee. If we are replacing any flowers or accessories, they will be additional. A single flower in a small dome ranges from $50-75. A prom corsage or wristlet in a dome/frame ranges from $100-150. 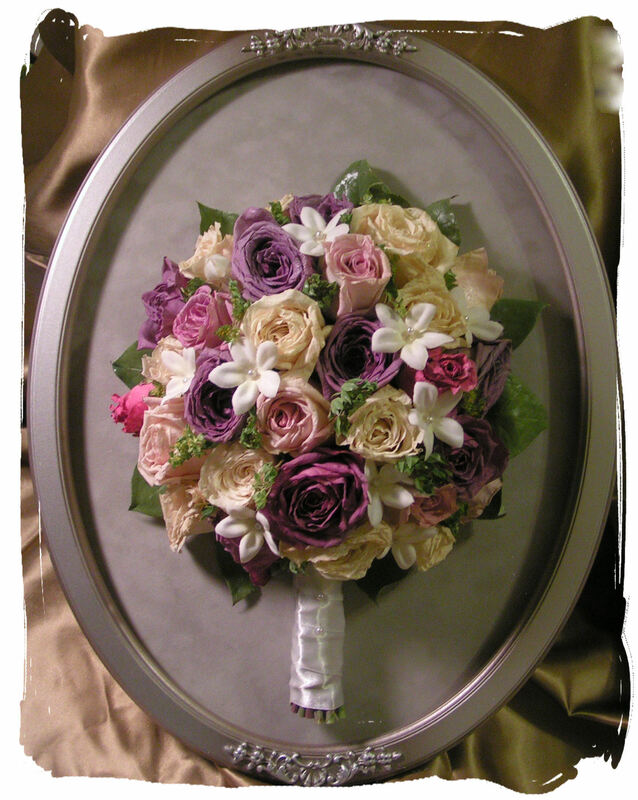 A standard sized wedding bouquet framed ranges from $450-575. 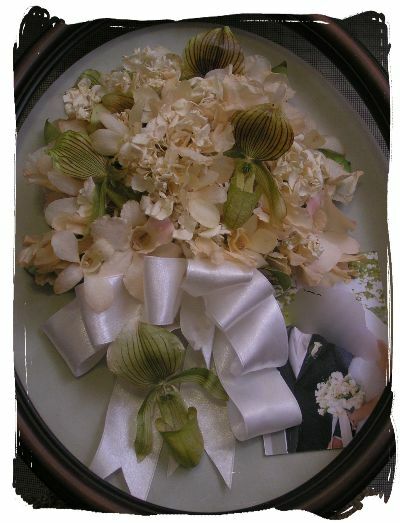 A grooms lapel and a few bouquet flowers dome/framed (as shown below ranges) from $250-350. 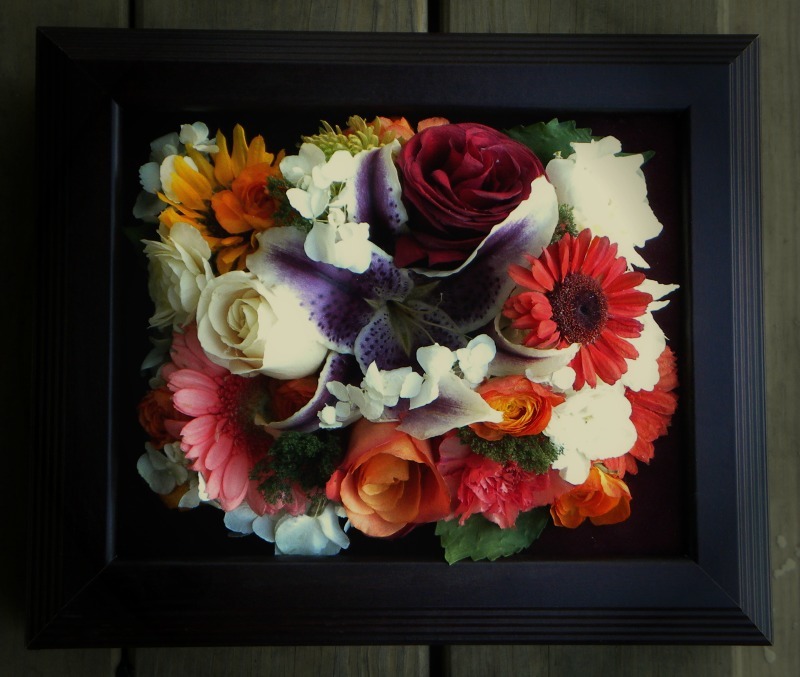 Single flowers unframed are $20. A bouquet made into a wreath/topiary without frame $350-450. To uncomplicate the process…the flowers are first placed into a deep freeze and can remain so indefinitely until your space becomes available. During busy seasons this could be up to 4 months. The freeze dry machine is much the size of two large home refrigerators, where the interior temperature is at -5 degrees. The flowers are transferred from the deep freezer and placed inside for up to 3 weeks where the moisture will gradually be withdrawn every day with the rising of the temperature. Upon coming out of the machine they are completely dry and not unlike a thin, delicate rice paper, which makes them extremely fragile. Some flowers preserve better than others to which we can advise you; if you question the success of certain varieties, please feel free to ask of your concern. The longevity of your flowers will depend on the conditions you display them; typically, you can expect up to 25 years or beyond . The more care you take, the longer they of course will last. Never display near high humidity, extreme heat, or direct sun. It is also not advisable to handle them any more than necessary, as they are extremely brittle. A small insect repellent is discretely hidden to ward off any possible intrusions, but an occasional watchful eye would be advised, as our insects of today enjoy all flowers, fresh or dried..